Could You Benefit From a Programmable Thermostat? If you are gone for large parts of the day, if you find that your energy bills are higher than you’d like or if the constantly changing weather causes the inside temperature of your house to become hard to manage, you might be able to benefit from a programmable thermostat. Instead of manually changing the temperature setting on your thermostat every time you want it warmer or cooler in the house, a programmable thermostat will do it for you, whether you are home or not. 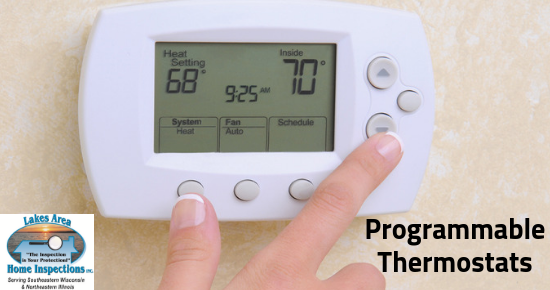 You can program your thermostat to run the heating or cooling system at different times of the day, which can cut energy bills by not running your system while you are not home or while you are sleeping. Programmable thermostats are not the same as smart thermostats. While similar in function (automatically adjusting the inside temperature in the house), smart thermostats take it a step higher and are more intuitive. The more advanced models not only connect to the home’s WiFi and give the homeowner the ability to change the settings through an app while away from home, but they also have the ability to “learn” about your heating and cooling preferences and automatically adjust settings accordingly. Many programmable thermostats come with factory settings set for the average family, but it is best to change the settings according to your specific needs. In the winter months, it is suggested to lower the temperature in the house by 10 degrees during the times you are out of the house at work, or when you are sleeping, then raise the temperature back up starting a half an hour before returning home or waking up. This same approach can be used in summer to keep the house warmer when you are not home, but cooler just before returning. Your comfort and safety matter to us at Lakes Area Home Inspections. A detail like the right thermostat can make your living environment more enjoyable, and we CARE about the details! When we inspect a home, we pay attention to the details that matter (big and small, inside and outside), and provide our findings in an informative report that is easy to understand. Call Lakes Area Home Inspections at 262-818-0911 to schedule your appointment with a trusted company who cares.